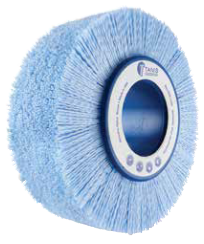 Wide Face Wheel Brushes feature an oversized brush surface, increasing reach and efficiency on large jobs. Use these powerful brushes for deburring, part finishing, edge radiusing, surface finishing and cleaning for ferrous and non-ferrous parts. For any filament width outside of our standard offering, contact our engineering team for information on meeting your application needs. CeramiX® Wide Face Wheel Brushes feature an innovative 3M mineral grain which provides enhanced cutting action up to 3-5 times greater than traditional abrasive filaments. Wide Face Wheel Brushes are also available in silicon carbide, an abrasive grain widely used in industrial applications and preferred for finishing ferrous metals.